Petrified Forest National Park is a fantastic park in northeast Arizona that preserves some of the United State’s best collections of petrified wood. This massive park’s central area can be experienced in a day, but of course, there is so much more to explore if you have more time. If you only have a day though, here is what I recommend you do starting from the north entrance and leaving from the south entrance. The park is about an hour and a half east of Flagstaff. I started from Highway 40 and then exited on Highway 180. From Highway 140, you will enter near the Painted Desert Visitors Center. There is not a lot to see at this visitors center but they have some petrified wood on sale, and you can ask any questions you have about the park. From here I headed to Tiponi Point, the first viewpoint you get to. This viewpoint and the rest in this area all provide amazing views of the Painted Desert, which is a collection of hills as far as you can see in red, pink and blue tones. Next we stopped at Painted Desert Inn, which is a historic landmark built in the early 1900s that used to be a hotel. The building is now a museum that preserves what it looked like when the hotel was in use. It is fun to walk around, to explore the old dining area and rooms and to see the prices that were on the menu when it was in use. Don’t forget to also go out to Kachina Point which is outside of the inn and another excellent viewing area. From here we made our way along the park road and stopped at a few of the five more viewpoints that were in the northern part of the park. Each of these viewpoints are quick stops and provide slightly different views into the wilderness area of the Painted Desert. After passing the last viewpoint, you will be at the small part of the park dedicated to Route 66. Route 66’s original road went right through this portion of the park. It is gone now though with the vegetation grown up to cover the road, but the electrical lines still mark where the road would have been. There is also a small display here with a plaque, information, and an old car. I am a huge Route 66 fan, so it was fun to see this historic area of the park. After leaving Route 66, you will drive for another 5 or so miles until you pass train track and enter into the middle portion of the park. The first stop in this section is the Puerco Pueblo. This quarter mile trail has the remains of some pueblo homes that were built in the 1200-1300 CE and also a vast collection of petroglyphs to see as well. Don’t forget to go into the small building on the trail to learn more about the area. A quick drive brings you to Newspaper Rock which is one of the most popular stops in the park. This overlook lets you look down on a huge rock that has more than 650 petroglyphs, some of which are over 2,000 years old. You really need a zoom lens or binoculars to see them well since they are far below you, but it is an excellent site and one of the best petroglyphs I have ever seen. From here the drive gets impressive as you enter the badlands area of the park and see the famous Tepees. I was blown away by how cool these colorful mountains were and pulled out a few times to take photos from different angles. It only gets better though as you head into the Blue Mesa, one of the most unique areas of the park. There are a few viewpoints here, but I recommend you take the short 1-mile hike down into them as you will be able to appreciate better the blue and purple hues of the landscape and will get your first real view of petrified wood. It was a pretty dreary day when we went but it was still awe-inspiring to see this area, and it was probably my favorite spot in the park. Petrified wood becomes the main draw of the rest of the park, with the first stop being at the Agate Bridge, a 110-foot petrified log that was reinforced with concrete to stay in one piece. Next up is a short stop at the Jasper Forest which has a high concretization of petrified wood that you can look out over. It is not as impressive as I am sure it was in the early 1900s before a lot of the wood was taken though. From Jasper Forest, you will get to Crystal Forest which is the most popular spot in the park. This mile-long trail gets you up close with thousands of pieces of petrified wood. I was blown away by how much they had there and how cool it was to see in person. The trail just keeps getting better and better as you head further back and see some substantial pieces of wood. Give yourself enough time for this trail as you will want to spend some time here checking it all out. We are now at the southern portion of the park. If you have time, visit the Rainbow Forest Visitors Center, which has some exhibits and information. Also, it is connected to the Giant Logs Trail which has some of the largest petrified logs in the park. Also, from here you can head out on the Long Logs or Agate House Trail which is about 2.5 miles if you do both of them. The Long Logs Trail leads through another collection of petrified wood, some of which is over 170 feet long. The Agate House Trail continues on to a seven-room pueblo house that used petrified wood for its construction. This house is especially interesting since I had never seen anything like it before. After doing this trail, your one day in Petrified Forest National Park is complete. Let me know what I left off in the comments that you like exploring in the park. Sedona is a beautiful city in Arizona that is full of unique attractions ranging from outdoor adventures and hikes to architecture, shopping and food. I have been going to Sedona for many years, and throughout that time I have gathered some of my favorite spots in the city to share below. Hopefully, this list encourages you to want to spend some time in this beautiful city as well and let me know what I left off in the comments. If you only have a little time in Sedona, then the best thing to do is to drive the Red Rock Scenic Byway. This stretch of 14 miles goes right through the heart of Sedona and shows you some of the amazing mountains and buttes like Bell Rock and Cathedral Rock, which are the main draw for visitors. Make sure to pull over at a few of the viewpoints as well for great photo spots. Next up, Chapel of the Holy Cross is one of the most popular stops in Sedona. It was built in the 1950s, and it is a Roman Catholic church that has won many awards for its unique architecture. You can walk into the chapel when it is open and see the cross, with the beautiful window views behind it that spotlight many of the area’s best mountains. Of course, the best view is from the bottom though looking up at the church that seems to come right out of the rock. It was even voted one of the seven best man-made wonders of Arizona in 2007. Located about 15 miles south of Sedona, Montezuma’s Castle is a quick stop but one that many visitors choose to go to while visiting Sedona. This national monument protects a Native American cliff dwelling used between 1100 and 1400 AD. You can’t go inside of it or anything, but it is still amazing to see from the viewing area below and well worth the short excursion out of the city. These next few recommendations are hikes since that is one of the main reasons that people visit Sedona. First up, Cathedral Rock is one of my favorite hikes in the area, especially for sunset. This short but incredibly steep hike takes you up the base of Cathedral Rock and to a viewing area that you have probably seen before online. It is a hike that will require you to do a little bouldering and use your hands to get yourself up, but it is still accessible for most people. The views at the top are incredible , and you will often see wedding photo shoots happening here since it is that pretty. Note the parking area is small though so try to go not on the weekends. Devil’s Bridge is the most popular trail in Sedona, and it leads to a massive sandstone arch that people walk across for photos. The hike is 4 miles round trip, and it is relatively easy until the end when you have to go uphill to get to the top of the arch. It’s a great hike though and another one you will want to arrive early to avoid the crowds. I made a video just on this hike that you can see here. My last hiking recommendation is Soldiers Pass. This hike is a popular one as there are spurs that led to all sorts of the other trails, caves, and viewpoints. The main reason people go though is for the Devil’s Kitchen which is a large sinkhole only about a quarter mile from the trailhead. If you continue on you can also go to the seven sacred pools which were of religious importance to many Native American tribes and which are still popular for many spiritual seekers today as well. Moving on from the hiking, downtown Sedona has Tlaquepaque which is a beautiful arts and crafts village that is a favorite stop for many visitors. The area has dozens of shops that sell everything from Native American jewelry and art to toys and clothes. My favorite shop there is the chai house though. They make a bunch of different kinds of chai drinks which are fantastic, and they have an excellent outdoor seating area for you to relax at while you drink your chai. For me, it is worth visiting this shopping area just for this. If you want to get some great views of Sedona without hiking, check out Airport Mesa Lookout. The Sedona airport sits on top of a large hill in West Sedona, and you can drive up to the parking area at the top, pay your $3 fee and walk across the road to get some great views of West Sedona and Coffee Pot Mountain. If you can find a parking spot at the pull out about half way up the mesa there is also a small trail that will take you up a small hill and which has amazing views both directions of Sedona’s famous mountains like Bell Rock. Whichever one you go to, you will have some great views. Red Rock Crossing is a small park south of West Sedona which is a great area for landscape photographers. It is also a beautiful place for the whole family to explore though as there are many short trails which leads to excellent views of Cathedral Rock. If you get lucky, you may even be able to take one of the famous sunset shots of the rocks reflecting in the water below you. My last recommendation before talking about food is the Palataki Heritage Site. This well preserved Native American area is run by the national parks service and preserves some cave art and cliff dwellings from the early 1300s. It takes about 30 minutes to drive here from West Sedona, and you have to call in advance to get on a tour as that is the only way to see it. The one hour tour is fascinating though, and I found the cave art to be especially impressive to see. Alright, now on to food. This is not an exhaustive list, but it is some of my favorite spots. First up, for breakfast head to Sedonuts, but get there early as they often sell out. If you are looking for something more healthy though, you can get an açaí bowl at Berry Devine or coffee at one of the many coffee shops around the area. For lunch, I like Wildflower Cafe for sandwiches and soups. They also have great views from their deck as well. Or if you are looking for a nice sit down spot, then head over to Creekside which has a great lunch and breakfast menu with lovely views of the mountains as well. Lastly, for dinner, I like Picazzo’s Healthy Italian Kitchen in West Sedona as it has a great menu of options for vegans, vegetarians, those that are gluten-free and meat eaters. Hideaway Cafe is another fun spot that has nice views and great pizzas, amount other things. If you can only pick one place though then I recommend Elote though. You have to get there at least 45 minutes before they open to get a table as they don’t have reservations, but it was easily the best food I had in Sedona and one that I highly recommend you wait for as it was for sure worth it. Order the Elote appetizer and you can thank me later. That’s it, my favorite spots in Sedona Arizona, let me know what your favorite spots are in the comments. Seattle, Washington is one of the most popular tourist destinations on the west coast of the USA. It is a city on the water with tons of things to explore ranging from outdoor activities to shopping, museums, and restaurants. I have been many times over the years and always find myself wanting to go back to this awesome town to see what new adventures I can find. I made a video and a list of my favorites below. Check it out and let me know what I left off in the comments. As one of the most famous places in Seattle, Pike Place Market is a fun stop in the city. You can see the famous flying fish in the market, walk down to the gum alley, or even visit the first Starbucks. I like walking up and down the rows of vendors and getting some fresh fruit or some seafood to cook at home. If you are planning to go to the first Starbucks, know that there will be a long line. You can always just take a picture here and go to my later recommendation for your Starbucks fix. Located near MoPOP and the space needle, the Chihuly Garden and Glass Museum is one of my favorite things to do in Seattle. All of the glass sculptures are created by world renowned artist Dale Chihuly, and it was opened in mid-2012. While pricy, this museum is amazing and features many pieces of beautiful glass art that are sure to impress the whole family. My favorite were the glass orbs that were sitting in the boats in the middle of the museum, but there is a lot to like here. As the most recognizable part of the Seattle skyline, the Space Needle is a great spot for tourists to visit. While not as tall as some of the other downtown observation decks, it has a great 360-degree view with an open-air observation deck. Below that there is a revolving area with a glass floor that you can walk on, which is a gun experience. Gasworks is my favorite park in Seattle. It has impressive views of the Seattle skyline and a unique collection of old metal structures. The park has a large free parking lot, and lots of places for kids and adults to explore. Many times I have grabbed lunch at a local spot and just gone out to sit on the park benches and look out over the city. Be sure to also walk up the small hill where they have a rose compass on top and good views over the entire park. Located in the northwest part of Seattle, this large park has miles of hiking trails, and is a beautiful place to explore. The main draw is the lighthouse located right out on the point, and which is accessed by a 3 mile round trip trail. The trail is nice, going through dense foliage and along coastal views to get out to the lighthouse itself. This park is a great half day stop that allows you to get a little workout while seeing an old historic lighthouse. Made famous by the movie 10 Things I Hate About You. The Fremont Troll is a much visit in the city. This troll lives under the massive Aurora Bridge and it holds a full Volkswagen Beetle in its left hand. Parking can be a little difficult here, but it is worth a short walk to see this big troll. Next to the Space Needle, this museum used to focus on music only but has shifted to include all pop culture. There are still exhibits on Nirvana and Pearl Jam, two important Seattle bands, but there are also exhibits on sci-fi movies, fantasy stories, and Marvel superheroes. Don’t forget to see the Chris Cornell statue that was just installed outside of the museum as well. This 9-acre park was created by the Seattle Art Museum and features a bunch of unique sculptures right next to the water. It is free to explore and features many permanent and rotating exhibits. The park also has benches to relax at that give you a good view out over the water. Walking into this massive Starbucks roastery feels like walking into a Willy Wonka inspired world. Copper pipes are running along the walls, all sorts of coffee making contraptions and roasting is pretty much always taking place. They have an extensive menu of options like cold brew aged in whiskey barrels and coffee related cocktails, as well as dozens of different types of pastries and pizzas. Do note, that the drinks are more expensive then you would anticipate here though. If you have seen my videos then you know I like the slightly strange spots, of which Archie McPhee easily fits onto that list. This store has been a Seattle staple for decades and features everything from masks and costumes to a yodeling pickle. In the back, they also have a rubber chicken museum complete with the worlds largest and smallest rubber chicken. I never leave without buying something from this store. As a huge fan of the outdoors, the flagship REI is something that I never skip a chance to visit. This store has pretty much everything you could ever want from an outdoor store, and a bunch of fun things to see like a wooden yurt and a three-story climbing wall. Plus, the parking structure gives you one hour free which is nice in downtown Seattle. Pioneer Square is a small area of downtown Seattle that features many of the cities most historic spots. In Pioneer Square, you can take the underground tour of Seattle, go to the Klondike Historical Park (which has many exhibits on the area) and visit the UPS waterfall (where the company UPS was created). Also, I always love visiting Flatstick Pub which is an indoor mini golf bar with food, drinks, and awesome mini golf courses, what’s not to like? Since Seattle is surronded by water, some of the best views are via boat. If you have time, you can take the ferry over to Bainbridge Island and explore for a half day, or if you don’t have time, take the water taxi over to West Seattle and hang out on the beach or eat at Marination Station. The water taxi provides excellent views of the Seattle skyline both directions, and if you are lucky, you might see some seals as well. Seattle is the home of Amazon, one of the most popular brands in the world and they have made their mark on the downtown. The Amazon Spheres are not open to the public, but they are a unique set of buildings to see while in the city. Next to them is an Amazon Go Store, which is a futuristic shopping experience where you download an app, scan it, then just walk out of the store with whatever items you grab to be charged automatically for them. It is pretty crazy to experience and certainly unique until these stores become more of the norm. In northwest Seattle, Kerry Park is one of the best views in the city. This small park has only a half dozen or so street parking spots, but it provides an amazing vista of downtown Seattle, the Space Needle and Mt. Rainer if it is clear. I have spent many sunsets and sunrises at this spot, and I never get tired of the views. Seattle is actually home to many amazing outdoor adventures, and one of the easiest to access is Snoqualmie Falls. This massive waterfall is only 30 minutes drive out of downtown Seattle, and it is a sight to behold. You can take it in from the observation deck viewing area, or you can go on a 1-mile round trip hike down to the bottom. While not super close when you get the bottom, it is still a fun viewing area for this impressive waterfall. Now moving into food, here are some of my favorite spots in the city. Paseo is home to one of the countries top rated sandwiches, and it is easy to see why. This small shop in Ballard, which has expanded to other locations around Seattle, has amazing Cuban inspired sandwiches. I recommend that you get the number 1 and it is rare that I don’t visit this spot at least twice when I am in Seattle. Donuts are one of my favorite things, which is why Top Pot is a must visit in Seattle for me. This popular donut establishment is located all over the city but the two-story flagship is my favorite. They have some fantastic donuts with a focus on unique types of old fashioned donuts, and I always enjoy trying whatever the seasonal flavors are. Marination Station is a popular food truck turned brick and mortar restaurant with multiple locations. I usually go to the Capitol Hill location, but if you take the water taxi I mentioned earlier then you can go to that one as well. The tacos are what you get here, and it is a Korean / Mexican mashup that is hard to beat. Thai food is a dime a dozen in Seattle, but my favorite spot is Thai Thom. It is situated in the downtown area near the University of Washington, and is tiny so be prepared to wait. It is fun to sit at the bar and watch them cooking the food in front of you, but I usually call in my order and take it to go to avoid the line. Since so many people will be looking for a place to eat near Pike Place I figured I would share my favorite. Beecher’s Cheese is a Seattle institution, and you can see them making cheese through the window when you are there. The grilled cheese and tomato soup is impressive here, plus you can try cheese samples while you wait. I recommend taking it to go and walking up to Rachel’s Ginger Beer to grab a fun flavored ginger beer to go with your meal. My last recommendation is Serious Pie, one of Seattle most popular pizza places. Started by famous Seattle restauranteur Tom Douglas, this spot has all sorts of amazing pizzas, with my favorite being either the clam pizza or the mushroom one. They also make biscuits which are amazing as well for a quick breakfast or even for a lunch sandwich. Check it out next time you are in the city. So there you have it, my favorite spots in Seattle. Let me know what I left off in the comments. Nashville, Tennessee is a big city with a small town charm. The city is relatively easy to get around and it has a lot of fun things to explore from restaurants and museums to parks and hikes. You can see a video of all of my favorite spots below and text on each one as well. Let me know what I left off that you love in Nashville and watch for my food blog on Nashville next week. Since Nashville prides itself on its country music history, it is no surprise that Johnny cash would have a strong influence on the area. The Johnny Cash Museum is one of the cities more popular tourist attractions and the small museum is expensive but it has a lot of stuff to see. I have been twice and enjoyed it each time. You can easily spend an hour or two here as there is a lot of information to read and watch about the famous singer. Located right off Bicentennial Mall, a stones throw from the capitol building, Nashville’s Farmers Market is the cities entry into the popular food court type estblishment seen in New York and Los Angeles. There are lots of places to grab food, coffee or dessert, with Jenis Ice Cream being my favorite stop in the market. Nashville has a huge art scene with murals popping up weekly around the city. Last I heard there was close to 100 and some of the more famous ones show up often on social media. If you are looking for a fun way to spend a few hours and you have a car, check out one of the online blog posts about the murals and go find a few. Country music is everywhere in Nashville so, of course, it would make sense to find the country music hall of fame here as well. This museum is gigantic and if you are a country fan you can easily spend a few hours here. There were exhibits ranging from Zac Brown Band to Little Big Town and even though I don’t like the music too much myself it was still fun to explore. No trip to Nashville is complete without going to hear some live music. You can do that by visiting one of the famous concert halls or you can just head out to Lower Broadway any night of the week and find dozens of bars with musicians covering all of your favorite songs. It can get rowdy during summer weekend nights but it is an area you need to experience in the city. Located inside the Country Music Hall of Fame, Hatch Show Print has been making letterpress posters for almost a century. To this day you can still see the process happening daily, take a tour to learn more about it and shop some of the most popular designs in their store. Ryman Auditorium is a building that has played an important part in Nashvilles history. Built in the late 1800’s the building was originally a church that attracted many of the inhabitants, but over the years it was reinvented as a music hall, complete with the original pew seating still intact. You can go on a self guided tour here to see if for yourself, or go to a concert while in the city to really experience it. The Grand Ole Oprey is the other famous building that houses some of Nashvilles biggest concerts and most famous singers. A good 20 minutes outside of downtown, this concert hall has tours you can take to learn the history and see the backstage area. I really enjoyed learning more about this place as its history is certainly unique with its members and the auditorium is beautiful to tour. Goo Goo Clusters have been a popular treat for over 80 years. They originated in Nashville though and you can visit the shop in downtown which has all sorts of Goo Goo related things to see and eat. If you are there during the right time, you can also pay to take a chocolate class and make your own cluster as well. Cheekwood Estates is south of Nashville and it includes the grounds of an old beautiful mansion that was donated to the city in the 1960’s. The grounds have been turned into a botanical garden with lots of blooms throughout the year and there is even a section with multiple miniature trains that go along a wooden track that is fun to see as well. Built for the … in … this building is something you would not expect to see in Nashville. The replica of the famous greek building has been meticulously recreated and is part of a large park on the west side of the city. When it is open, the inside also has a small art gallery on the bottom floor, and a massive sculpture of Athena on the second floor. The sculpture was add in the 90s and it is said to be the largest indoor sculpture in the United States. If you are looking to hike while in Nashville, then check out Radnor Lake State Park. About 20 minutes south of the city, the park has dozens of miles of hiking trails with the most popular being the trail that takes you on a loop around the lake. The park can get busy though so get their early during summer weekends if you want to get a parking spot. Pinewood Social is the popular attraction for 20 somethings in Nashville, but it is fun to visit for all ages with its restaurant, bar, coffee shop and bowling alley. I haven’t actually bowled there myself as I usually opt for the coffee shop or bar but I am sure it is a blast, plus the outdoor area has a bunch of attractions like bocce ball, and airstream and a pool for the summer days. Belle Meade is an old plantation from the mid-1800’s which is now part of a compound that you can tour and which includes structures and Nashville history from this time period. The grounds include an old house, milk area, original slave quarters and mausoleum. There are two tours you could go on, one that goes inside of the mansion and another that looks at the plight of the African American workers during this time period. Plus, all tours and even the grounds only ticket come with a free wine tasting, which is a fun added bonus. This last recommendation is about an hour and a half outside of Nashville but it’s a blast and worth the trip. There are tours that will take you here from Nashville or you can just drive if you have a rental car. Jack Daniels is of course a massive operation and it is a lot of fun to go see the process, including how they burn the pallets for charcoal? And where they get their water for the famous whiskey. Plus at the end, you get to try a bunch of different types of whiskey which is always a plus as well. Right in the middle of Nashville, the John Seigenthaler Pedestrian Bridge is a great spot for a good view of the city skyline. The bridge is only open to pedestrians and no car, so you can walk, bike or even scooter across it. Its a fun way to get a little activity and some great views while in Downtown Nashville. Let me know if what I left off in the comments. Portland is such a fun town to explore with tons of great restaurants, hiking trails, and stores. While I haven’t spent as much time here as I would like, I do normally get up there at least 3-4 weeks each year. During my time traveling around the city, I put together some of my favorite spots and you can see them in video and written form below. Let me know what I left off that you love doing in Portland in the comments. Portland’s Japanese Gardens sit on 12 acres with eight different gardens spaces and a small museum. It is a beautiful place with lots of areas to explore like the pond garden, sand and stone garden, and flat garden. Don’t forget to walk across the street to the International Rose Test Garden which has over 650 varieties of roses and which is free to check out as well. Claiming to be the world’s largest independent bookstore, Powell’s Books is over 68,000 square feet. It is such a fun place to wander around with lots of books, board games, and magazines to explore. There is even a cafe inside as well if you want to get a drink and relax. From the largest bookstore to the worlds smallest park, this small urban park is the Guinness Book of World Records smallest in the world. The plants that are in the park change often and it even has a plaque. It’s a short stop but a fun part of Portland’s personality. Created in 1898, this museum features three stories of exhibits on Oregon and its history. The main reason to go though is to see the Portland Penny which supposedly was used to decide the name of the city. In 1845 they were considering Portland and Boston as the city’s name and the penny chose Portland. This tram carries people from the waterfront to the Oregon Health and Science University, but it is worth going on even if you don’t need to go to the university. For a couple bucks you can grab a ticket and take the ride up to where they have an observation deck that gives you great views of the city and Mt. Hood in the distance if it is clear. The Kennedy School was one an elementary school that opened in 1915, but after being purchased by McMenamins, the school was completely remodeled to include a 50 room hotel, multiple restaurants, a bar in the old boiler room, a cigar lounge in the dentention center and a movie theater in the auditorium. It is a ton of fun to walk around and explore or even to stay at while in Portland. Lan Su Chinese Garden is a place of relaxation that encompasses an entire city block in the Chinatown area of Portland. It features beautiful gardens, a tea house, and a few small ponds. It is a very tranquil spot to explore in the city. Portland is known for its bridges and one of the best ways to see them all is just to walk along the water in the 36-acre Tom McCall Waterfront Park. It is a popular spot for bikers and joggers, and they often have events and fairs down by the water. Don’t forget to see the white stag Portland Sign in the north part of the park near the Burnside Bridge. When you get to the north part of the park, and you are near the Portland sign, then you should head inland and go to Voodoo Donuts. While people go back and forth on their love for Voodoo, it is still a Portland institution, and you will always see people carrying the pink box through the airport. This small shop is next to the “Keep Portland Weird” sign which is good for a photos and the donuts are unique and cheap so you can try a few different ones. If you are a donut fan though, make sure you also check out Blue Star while in the city. Adventuring out from the city, Rocky Butte is one of my favorite spots for sunset. This volcanic cinder cone has a park on top of it, and you can see Mt. St Helens and Mt. Hood on a clear day. You can also see down into Portland a little bit, but it is mostly covered by trees. Known as the Sanctuary of our Sorrowful Mother, the grotto is an outdoor Catholic garden which features auditorium area with a large grotto cave. There is a second story area with shrines, a chapel, a meditation chapel that looks over the city and a peace garden as well. It is a beautiful area to explore near Rocky Butte. Heading east from the Grotto, if you are looking for a half day trip, consider heading out to the Columbia River Gorge, especially Multnomah Falls. 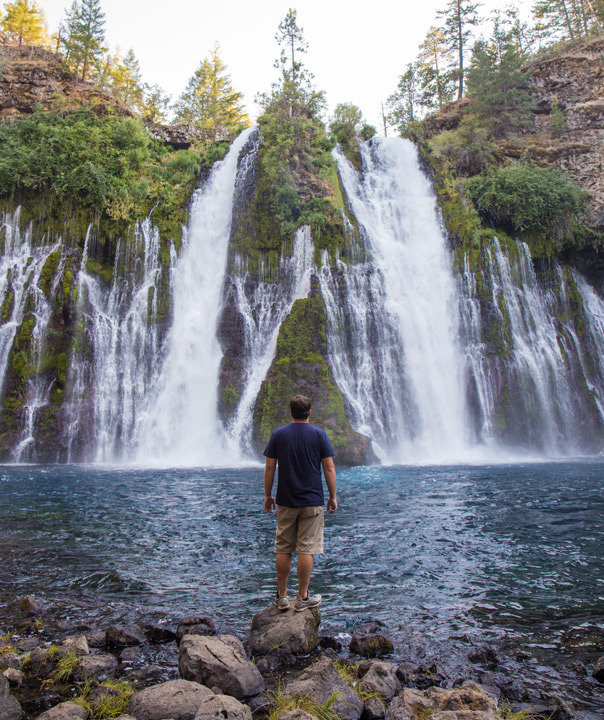 This waterfall is one of the most visited destinations in the Portland area and it is easy to see why. The waterfall cascades down with the bridge in between and it is very picturesque. It is a short walk to see it, and because of that it is incredibly busy during the summer so get there early, especially on the weekends. Heading back to the city, St. Johns Bridge spans the Willamette river in the north part of Portland and it an impressive bridge to see in person. Below the bridge, there is a beautiful park that sits in the bridge’s shadow and is an excellent place for a picnic or just to walk around. In Portland’s Forest Park area there is a short hike that takes you down to the remains of an old house with an interesting history. The house is pretty cool to see and photograph since the plants have grown up around it and the stone structure is well maintained. It’s a nice short hike with an interesting payoff, as part of a larger trail system. You may not know this, but outside of Portland, there are over 700 wineries, many of which specialize in the Oregon pinot noir which has become really popular over the last few decades. You can be in wine country in less than 45 minutes, exploring many of the offerings. Some of my favorites are Hawk’s View and Ponzi, both which have great wines and amazing views. Also, Tualatin Valley has a Top Golf as well which is a ton of fun if you haven’t done it. Pine Street Biscuits is a favorite spot for breakfast and lunch because of their fantastic homemade biscuits and gravy. I have taken many people here, and they are never disappointed. Be prepared to wait on the weekends, but they are usually pretty fast. I always get the Reggie myself but I have had half the menu, and there is a lot to like. Pok Pok is a Thai and Southeast Asia restaurant with an extensive range of options but most famous for Ike’s Vietnamese Fish Sauce Wings. These wings are marinated in fish sauce and sugar, then deep fried and tossed in garlic. Even if that doesn’t sound good to you, I recommend you give them a try. They are incredible and one of the rare dishes that lived up to the hype for me. It is hard to beat good ice cream and Salt and Straw has risen to the top for me. With flavors ranging from honey lavender to almond brittle, there is something for everyone. Plus they have five to six new flavors each month that can be genuinely unique like pear and blue cheese or a menu of Thanksgiving inspired ice creams. Huber’s is the oldest restaurant in Portland, and it has become a hugely popular spot for the Spanish coffee spectacle they put on when they make your drink. After sitting down at the table and ordering, a bartender will come over and put on a 45-second show full of fire to make your cocktail. It is a lot of fun, and you will see it being continuously made on a busy night. Portland is a popular spot for coffee, and I am happy to say I indulge in it everytime I visit. Stumptown is one of the most popular since they have multiple locations and one is close to Powell Books, but if I had to pick, Heart is probably my favorite. I usually always take a few pounds home when I go there. Portland is also a craft beer city, and honestly, I could make a whole video on all of the beer to try here like Deschutes, Breakside, and Hair of the Dog. One that I do want to share is Ex Novo though. They make great beer, and one of the things I like about them is that all of their profits go towards charity. They support charities like Friends of the Children, International Justice Mission and Mercy Corps. It is fun to drink good beer and support a worthy cause. Alright, I think that is it, please let me know what I left off in the comments so that I can explore more places in Portland. I got a chance to spend four days in Salt Lake City in late 2018 and had a blast exploring all over this famous city. 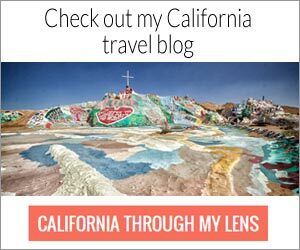 I was shocked by how many fun adventures there are to be had here, ranging from seeing the bison on Antelope Island to diving into the cities culinary scene. I put together my favorite spots in a video, and you can see the video and all of the recommendations below. Utah National History Museum is located at the base of the hills on the east side of Salt Lake City. This attraction is great for the whole family featuring four floors of interactive exhibits. The most impressive is the large dinosaur exhibit they have in the middle of the museum. It is awe-inspiring and if you have never seen dinosaur bones in real like you will appreciate it. Don’t forget to go to the top floor where they have a patio with views of Salt Lake City. While at the Utah Natural History Museum, consider taking a hike on the popular Living Room Trail. This short two-mile hike is no joke, with over 1,000 feet of elevation gain to get to the top. But once you are there, you are greeted with some amazing views of Salt Lake City and a bunch of makeshift pieces of furniture that make from the rocks and representing chairs and couches, giving the trail its living room name. Often called one of the most beautiful capitol buildings in the USA, it is easy to see why when you visit. When it is open, you can wonder the main floor, look up at the sprawling dome and see all of the marble-covered walls. I spent a good 30 minutes here as it was breathtaking. You can also see the senate and house of representatives meeting rooms if they are open as well. A great, free spot to check out in Salt Lake City. This museum is designed to preserve pioneer history and they have done just that with more pieces then I have ever seen in a museum. There are four floors filled with artifacts ranging from spectacles and dolls to old photos. It is a truly overwhelming place with days worth of things to see, especially if you are into the history. Do be sure to head to the basement though where they have a preserved two-headed lamb and a really unique old fire engine. it is a free spot to visit and worth checking out. Regardless of your personal views on the religion, Temple Square is a great spot to explore in Salt Lake City. The large courtyard area is open to the public daily, and you can see the old historic buildings, the concert hall and the temple itself. The temple is massive, and the best views are from the east side, where there is a pool that has a perfect reflection of the temple in it. Next to Temple Square, the Family History Museum is something that people come from all over to explore. This area houses centuries of ancestry information, and if you sit with them and create an account for 20 minutes, you can walk around and see lots of information about your relatives and lineage. My last recommendation in this specific area of downtown is the City Creek Shopping Center. I am not a huge fan of malls myself, but this one is pretty cool with a beautiful indoor and outdoor walkway and lots of unique shops. Its great for photos as well as there is a creek that runs down the middle of some of the walking areas. Moving on from the downtown area, the Cathedral of Madeline is a roman catholic church that was built in 1909 and which is the only cathedral under the patronage of St. Mary Magdalene. It is a beautiful old building to check out, and if you are into architecture like this, then you should definitely check it out. Built by Thomas Battersby Child in the mid-1900s this small park houses a series of unusual symbolic statues, including one with Joseph Smith’s head on a Sphinx body. The park has 12 sculptures in it and over 70 engraved stones around the walkway. I like finding the more unusual spots like this when I travel, which is why it is on this list. I told you that I like to explore unique spots and this gravestone in the Salt Lake City Cemetery is undoubtedly that. This headstone for Lilly Gray get tons of visitors every year because of its unique inscription which reads victim of the beast, 666. While not much is known about it, it has quickly become a popular spot for visitors and one that is always inquired about at the Utah Historical Society. Many people don’t know that Kentucky Fried Chicken actually started in Salt Lake City. This famous fast-food chain still maintains the original restaurant, and it is fun to visit. Outside there is a statue of both the founders and inside there are all sorts of pieces of history, including one of Coronel Sander’s suits. It is a quick stop but its fun to eat some chicken in this historic restaurant. The Leonardo Museum is my favorite museum in Salt Lake City. I appreciate when museums are interactive, and that is just what this spot is. They have new exhibits every few years, and when I went, the main one was on flight. There were all sorts of science experiments you could interact with about flight and a large plane which has a slide you could go down. Heading upstairs they had an exhibit on optical illusions and one on Legos which were both pretty cool as well. Across from that is my next recommendation for a quick stop, the public library. Sure, most people wouldn’t see a library as fun, but this one in Downtown Salt Lake City is beautiful. The library has floor to ceiling glass windows, a glass elevator and a large deck on top where you can read a book or just look out over the city from a high vantage point. Also, there is a large stairway that adds to the stunning architecture and connects you with the viewing deck. Just a unique spot to check out in the city. Located in the popular Liberty Park, this 8-acre aviary houses over 130 different types of birds and was opened in 1938. You can spend a few hours here just walking around and checking out all of the different species, which range from eagles to condors. Many of the exhibits are interactive as well with you being able to enter into an enclosed area and see the birds fly around you. Fun for the whole family, but I even enjoyed it without kids as well. My last three recommendations leave Downtown Salt Lake City, and the first is This is the Place Heritage Park. On the east side of Salt Lake City, this park has a large monument that was designed to commemorate where Brigham Young first saw Salt Lake Valley and where he decided it would be there home. There is a large heritage village here as well which has many houses designed to look like what the original city would have looked like. there are animals to interact with here, volunteers that will tell you about the time and even a train that takes you around the park if you don’t want to walk. On the way out, also stop and see the National Pony Express Monument as well. Big and Little Cottonwood Canyons are popular winter destinations for skiing and snowboarding, but during the summer they become excellent hiking spots and great areas for scenic drives. I recommend going during the fall if you can, as you can drive through all of the fall colors and it is a truly memorable experience. If you have a full day, then stop at the many trail heads and head out on a hike up to one of the lakes. My last recommendation before talking about food is Antelope Island. This is probably my favorite spot in Salt Lake City as it is beautiful with tons of hiking trails, great views of the lake itself and lots of bison. The bison freely roam the area, and while you don’t always see them, often they will literally be wandering along the road only 15 feet from where the cars drive. It is a super cool spot to spend a few hours at. Be sure to also hike up to Buffalo Point as well which is a short half mile and has impressive views of the surrounding area. Now to jump into food, my first recommendation is Red Iguana. Red Iguana is the most popular spot in the city if you look at places like Yelp and TripAdvisor and this restaurant is almost always busy because of it. They make some excellent Mexican food with a focus on mole and really good salsa, so it is an easy recommendation. If you go to the second location, be sure to check out the massive iguana outside. 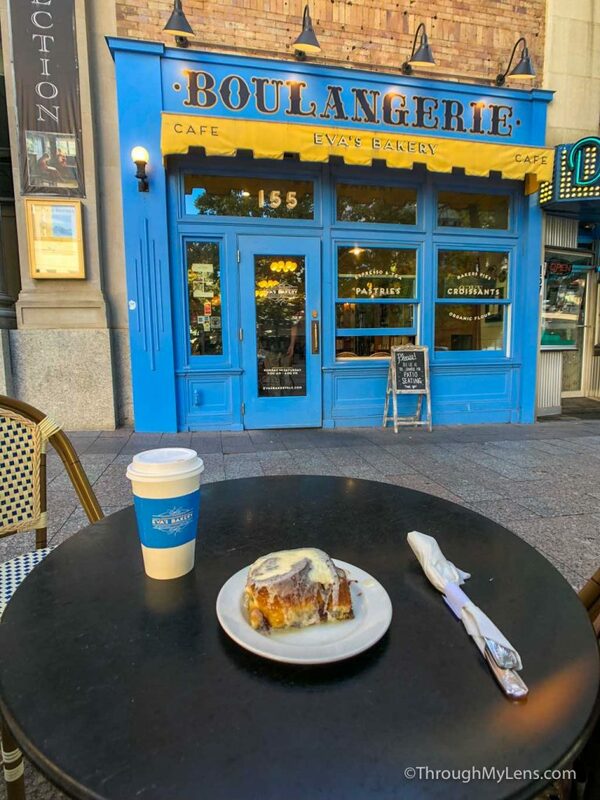 This bakery in Downtown Salt Lake City has a fun french vibe from the outside and makes terrific pastries. I like going here for a quick breakfast while in town since they have good coffee and all sorts of amazing food items to choose. They have a small sit down restaurant in the back as well. Caputo’s market and deli is an excellent lunch spot in Salt Lake City. They make some fantastic sandwiches, with my favorite being the Caputo, and the large area is always filled with people. Also, they have a fish market, cheese cave for all their specialty cheeses and a chocolate bar, it’s like a small foodies paradise. With the gastropub type vibe and their own beers brewed on site, Avenue’s Proper is a popular SLC establishment. I have been many times, yet I find myself always going back tot he chicken and waffles. The chicken sausage they use for these is fantastic the thyme-infused maple syrup takes them over the top. Also, they share a building with Hatch Chocolates a family run candy maker, and you know that nothing goes better with chicken and waffles then some good chocolate. Oh Mai sandwich kitchen is probably my favorite spot in Salt Lake City. I already love the banh mi sandwiches, but this spot does the best ones I have ever had. My wife loves them too cause their vegetarian banh mi is fantastic. Its hard to beat a meal this food for 6-7 bucks. So there you have it, my recommendations for places to visit in Salt Lake City, be sure to leave your favorite spots in the comments. Hello, my name is Josh and I am a photographer and traveler. Come with me as I find new and unique places to explore all over the world.